On December 1st, 1958, Our Lady of the Angels Catholic School in the Humboldt Park neighborhood of Chicago caught fire. It claimed the lives of 92 children and three nuns and left more critically injured. 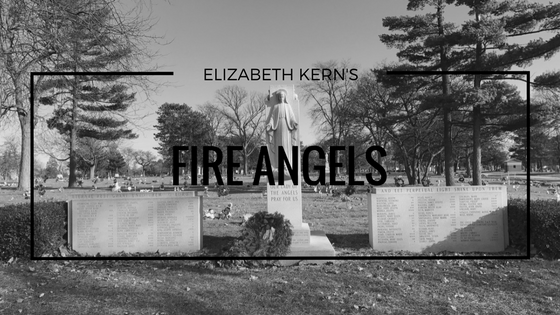 Although Elizabeth Kern was not a student during the time of the fire, the event still hits close to home for her. “Many of the ninety-two children who perished in the Our Lady of the Angels fire were my age, and I identified with them,” she said. She was also living in the area, approximately three miles east of the school. It was a tragic event that was always in the back of her mind, and after reading the non-fiction account of the fire, To Sleep with the Angels, she found her next book topic. She started outlining Fire Angels after having a conversation with John Kuenster, one of the authors of To Sleep with the Angels, and spent a year on researching the topic more in depth. “Not only did my memories as a child come rushing back, but now as an adult and an author, I understood the fire in its complexity and also saw elements of a gripping story that I might be able to tell as historical fiction,” she said. By creating a voice for an actual flame, – “an entity that’s insatiable, duplicitous, haughty, evil, cocky and caustic” – emotions meant for people become translated into this entity. The reader goes through sadness and anger and disappointment just through the eyes of the flames alone. It is truly captivating. Since the tragedy of the Our Lady of the Angels fire, there is one positive outlook that came from it. Improved and more heavily enforced safety standards were created within schools, despite Our Lady of the Angels being legally in compliance with the fire safety law of that time and passing an inspection mere weeks beforehand. A flicker of a flame and a bit of curiosity is all it took for tragedy to strike at Our Lady of the Angels. Fire Angels perfectly balances the facts and the fiction and creates an alluringly heartbreaking story.